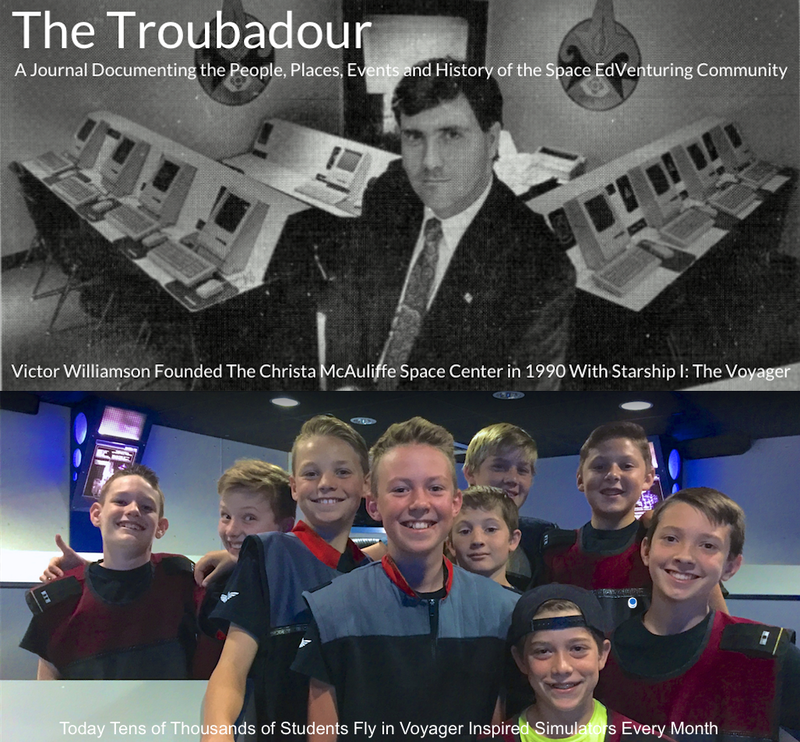 The Troubadour: James Porter Inducted Into the CMSC Time Lords. A Report on January's Honor's Night. A New Phoenix Set Director. A Gaggle of New Flight Director Trainees. 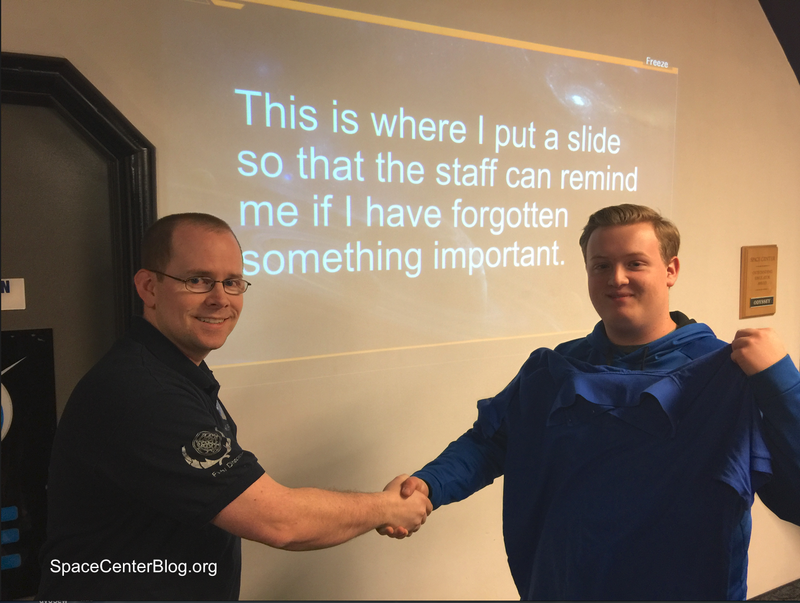 Meet the Space Center's Next Generation of Supervisors and Staff. Now is the Time to Join the Volunteering Staff. Imaginarium Theater. 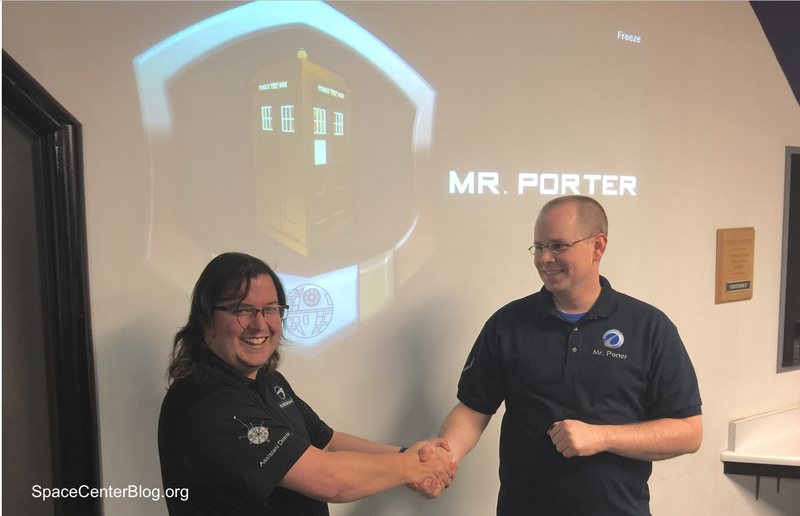 James Porter Inducted Into the CMSC Time Lords. A Report on January's Honor's Night. A New Phoenix Set Director. A Gaggle of New Flight Director Trainees. 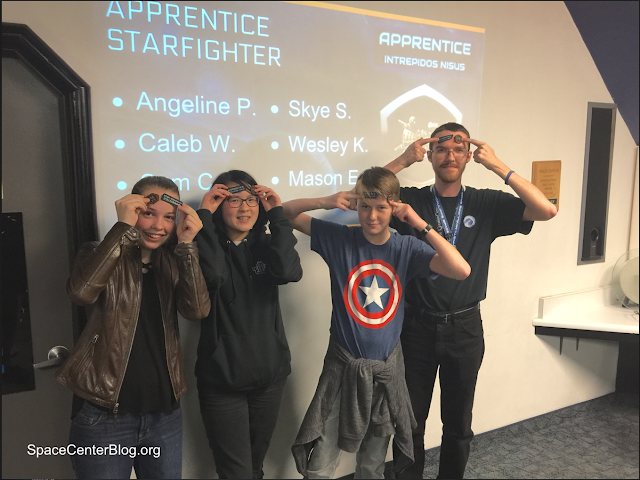 Meet the Space Center's Next Generation of Supervisors and Staff. Now is the Time to Join the Volunteering Staff. 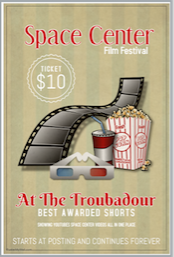 Imaginarium Theater. The Christa McAuliffe Space Center celebrated another Honors Night on January 22, 2019. I make it a point to attend every Honors Night for numerous reasons; 1) I started the place. 2) I volunteer as the Saturday Refreshments Coordinator providing weekend refreshments to the Center's hard working staff and volunteers. This includes Assistant Space Center Director Jon Parker's Dr. Pepper - his elixir of choice which keeps him awake and coherent during those Friday nights and Saturdays of back to back missions. 3) Let's not forget the fact that I represent The Troubadour which has covered all Honor's Nights since the blog's inception in 2008. The following is my report on Honor's Night. While much of the report is factual, there may be bits here and there added to keep me from getting too bored as I recite the evening's events. James Porter Becomes the Newest Time Lord. 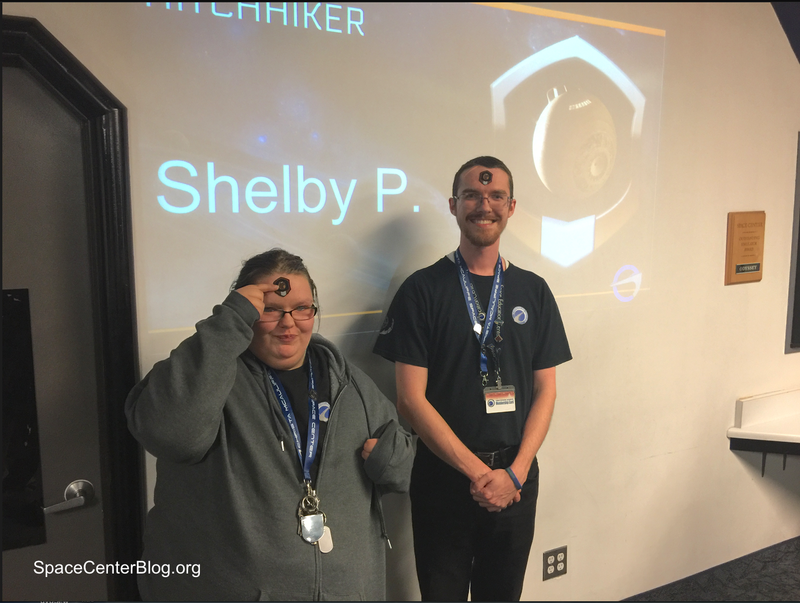 Celebrations on Gallifrey Lasted Well into the Night While Most of the CMSC Staff and Volunteers Were in Bed by 10:30 P.M. Yes friends, Mr. James Porter, Space Center Director Extraordinaire was inducted into the Time Lords last Tuesday. Those present comprising the induction coven were fellow Time Lords Jon Parker, Mason Perry, Lorraine Houston, and yours truly. We circled our Tardises in the gym, donned costumes of the period so as not to frighten the younger volunteers unaccustomed to the mysteries of time and space, and gathered in the Discovery Room for the time honored occasion. A short video was shown which included an interesting bit provided by James Porter's Irish cousin freshly surfaced and cleaned up from a coal mine just south of Londonderry. Normally we toast a new Time Lord, but because of a shortage of Romulan Ale (someone drank the lot we'd set aside for the event) and the fact that minors were present, we postponed the toast to a more fitting time to be announced at a later date. Congratulations James. Your skills are needed as we battle the forces of darkness dedicated to enslave the universe. There is also your innate sense of supreme sarcasm and humor - much needed at the Time Lord reunion banquets. Jon worked through his best material years ago and I'm on probation for things said at the last gathering. Why is it the Phoenix always has outstanding set directors? 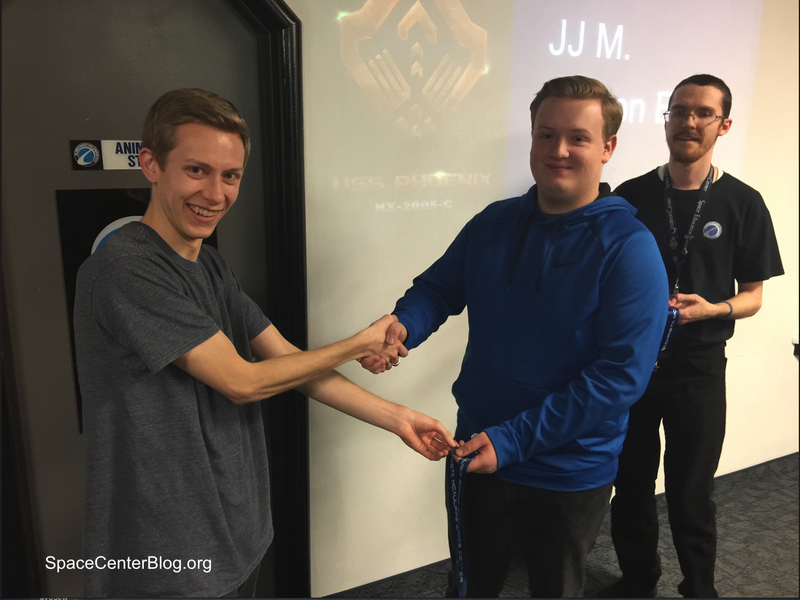 That tradition continued with the appointment of Jordan Smith as the new Phoenix Set Director replacing Jon Parker who has been given other duties as Assistant Director of the Christa McAuliffe Space Center. At least that is story Jon tells. Rumor has it that Jon is responsible for the disappearance of the Romulan Ale set aside for Mr. Porter's Time Lord toast. According to the CMSC staff, Jon has been in a better mood lately and more forgiving of minor mistakes in the operation of the simulators. There is also the time I found him outside the Space Center on a cold Saturday evening throwing snowballs at passing cars while shouting, "Fire Photon Torpedoes!". Regardless of how he got the appointment, we want to congratulate Jordan for his new position. Jordan is an outstanding young man whom I've known for several years. 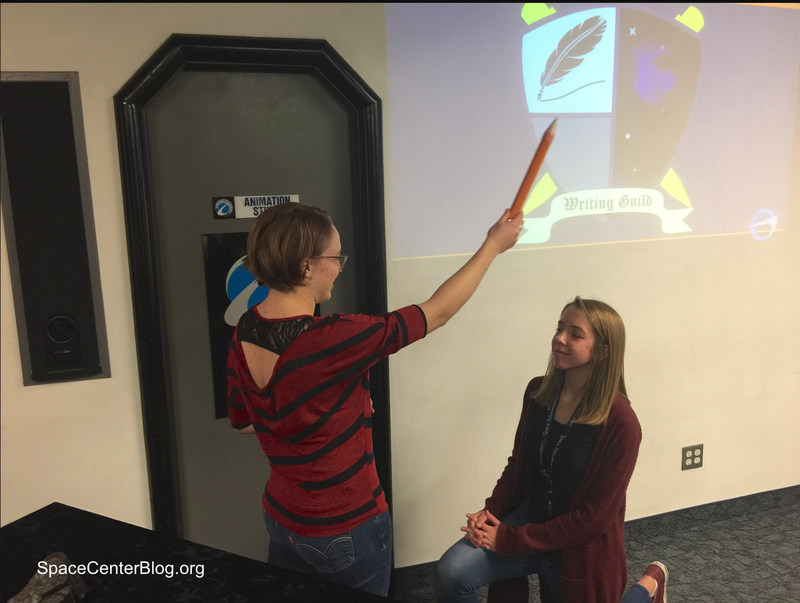 Brylee Perry is on the hunt for new writing talent which is why she was pleased as punch to induct young Lady Katie into the CMSC's Writing Guild. 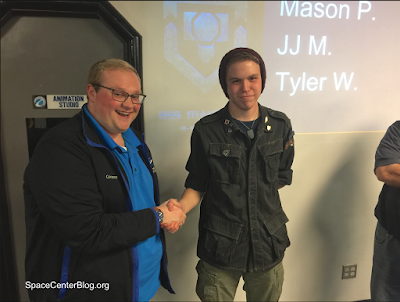 The Few, The Proud, the Chosen Welcomed into the Christa McAuliffe Space Center's Flight Director's Training Program. 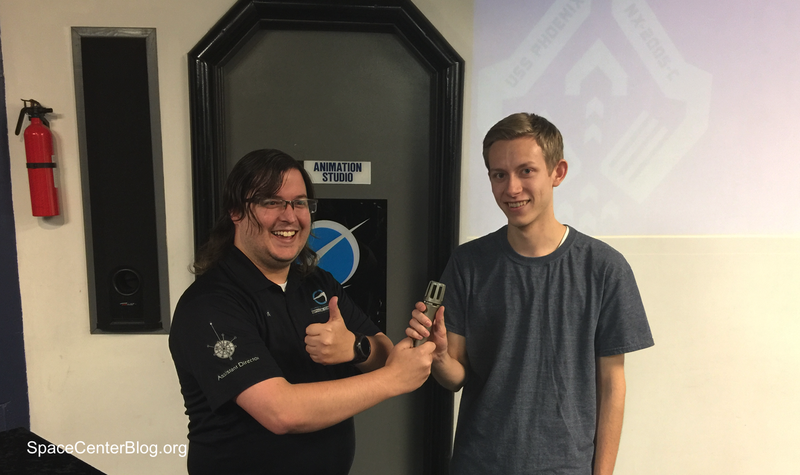 One of the happiest things I get to post on The Troubadour is the appointment of new members into the Space EdVentures Flight Director's Guild. 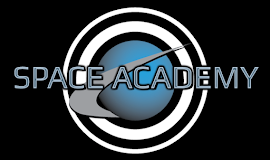 The Guild's membership is composed of outstanding flight directors at the Christa McAuliffe Space Center, The Space Academy at Renaissance Academy, the Lions Gate Center at Lakeview Academy, the Canyon Grove Academy Discovery Space Center, and the Telos Discovery Space Center. 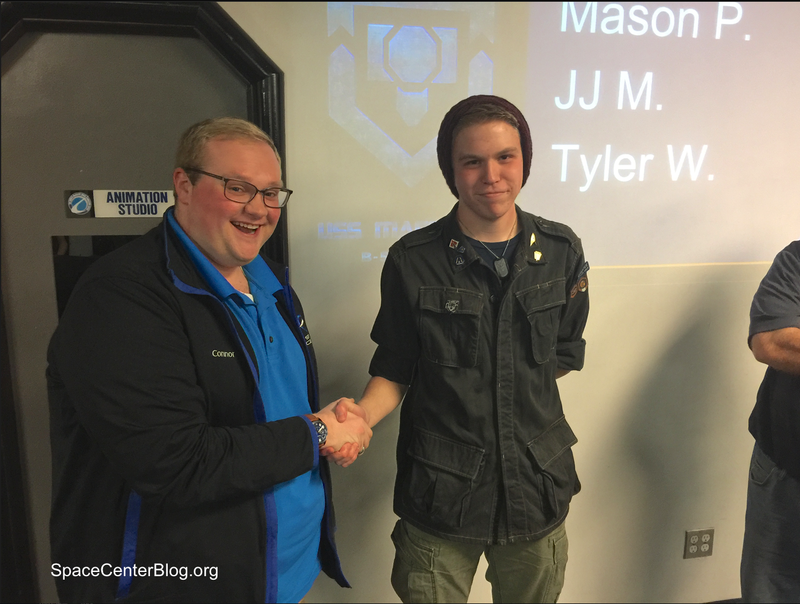 Getting into the Guild is difficult, requiring months of training (sometimes years) involving both hands on practice and critical reviews and evaluations of practice missions. 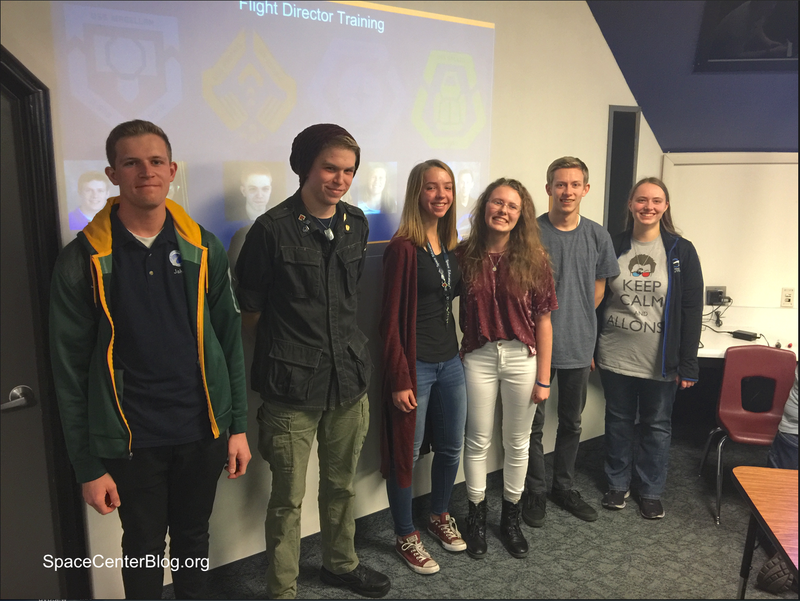 New Flight Director trainees: Jake H, Mason P, Katie Y, Alexis L, Jordan S Marissa O. 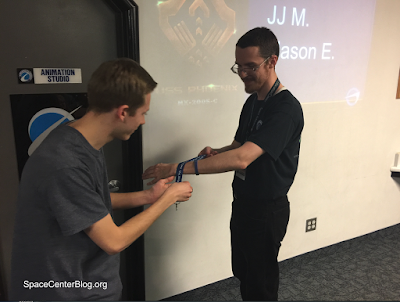 New flight director trainees were introduced at the CMSC's Honors Night on Tuesday. I say "new" which is true for most of them except Jordan Smith and Jake Hadfield. Jordan is a Phoenix flight director. Jake flies the Galileo. They both will be training to fly other simulators. 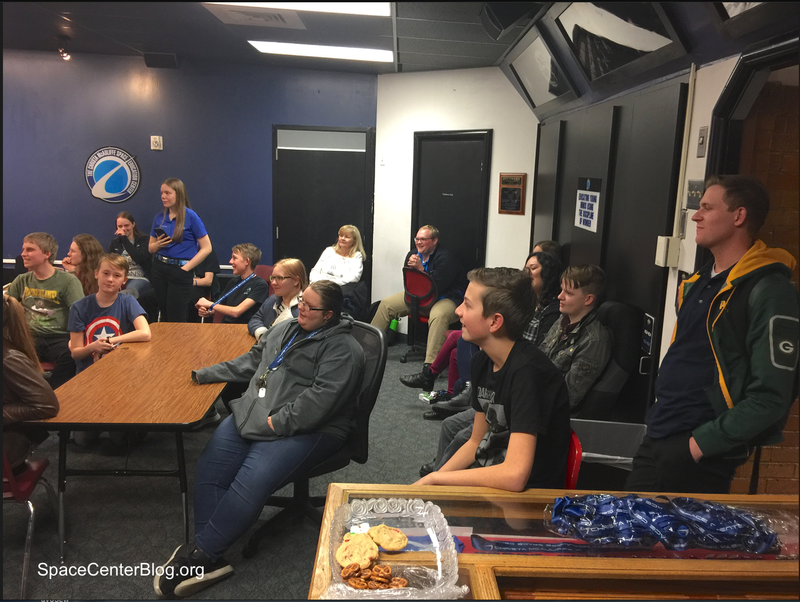 "We need new flight directors, especially as old ones retire and move on with life, and because we have the new center opening in about two years. 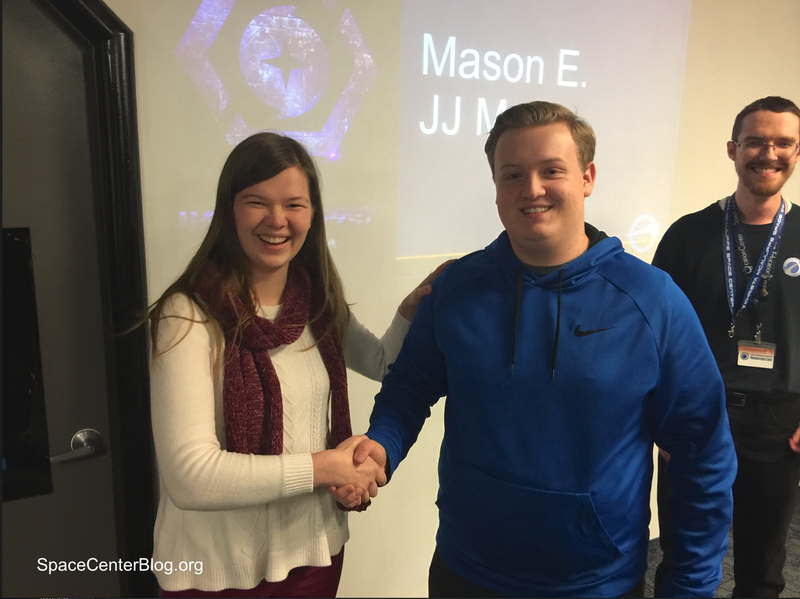 It is time to start training the next generation, and here they are," Mr. Porter said as he introduced them to the congregation. The unsung heroes in the Space EdVentures simulators are the Supervisors. Supervisors work in the largest simulators; the Voyager, Magellan, Everest, Valiant, Hyperion, Apollo and Artemis. Often times they are the ones tasked with cleaning up a Flight Director's mess up mid flight. 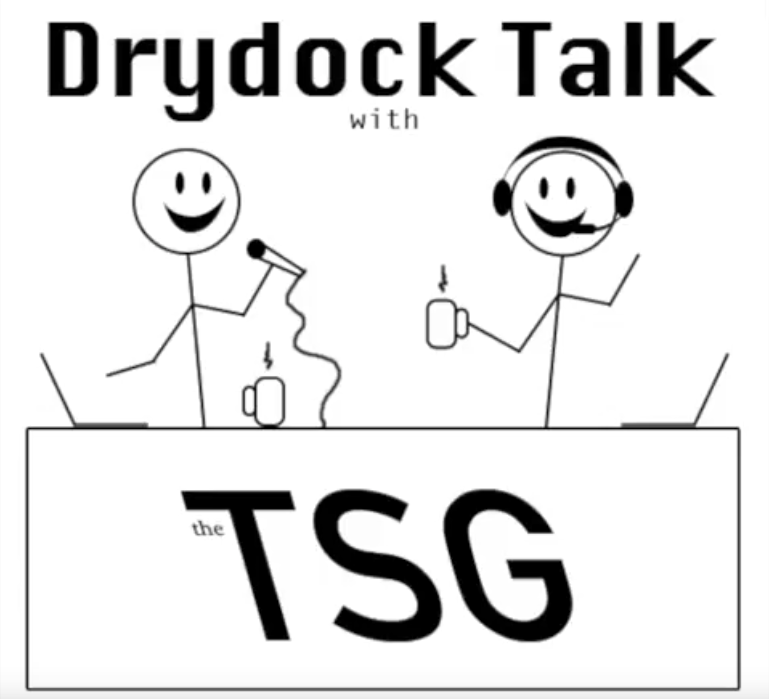 They deal with the volunteers, the crew, the landing parties, the FD's temper, the dispensing of sugar, the calling of shots, bathroom escorts, ship cleaning, and the fetching of the Director on Duty when things go really bad. I have the utmost respect for their work. 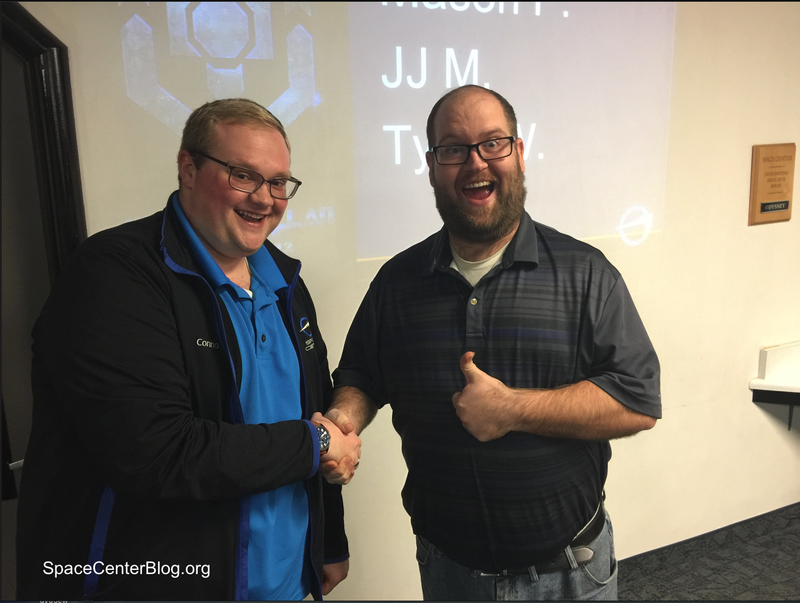 JJ M was given his Supervisor Blues on Tuesday. JJ M is a rising star at the Christa McAuliffe Space Center. 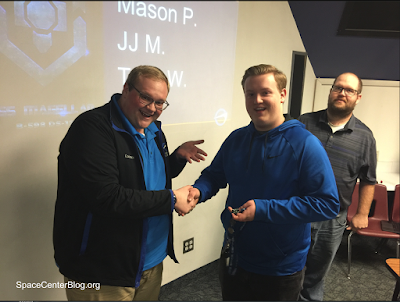 With the Blues, JJ M joins a long line of outstanding Magellan Supervisors. Congratulations JJ M, and bless you for patience; you'll need them to work with Connor! Speaking of Patience, God Bless Audrey H. for Accepting the Job of Head Supervisor on the Magellan. Using the Magellan Control Room bridge phone as a sceptre, Connor Larsen crowned Audrey H., Lady Supervisor of the Magellan at Honors Night. Audrey took the phone knowing fully what the job entailed. She has been a Magellan supervisor for quite a while and is aware of the politics and drama that goes with the job. 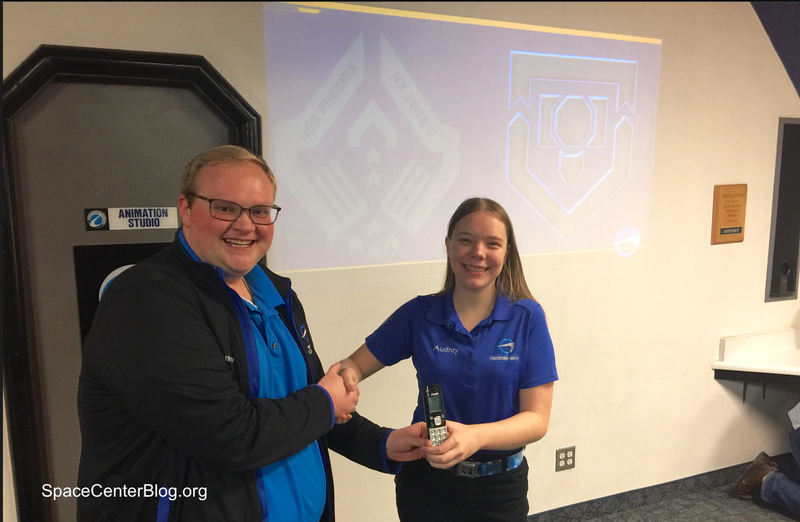 Audrey is one of those people who keeps the Space Center going with her work ethic, kindness, generosity, and talent. She's the right person to bind the wounds of those not use to the tension and high expectations Conner expects of his staff. According to Conner, there is only ONE simulator at the Space Center - the Magellan. The rest are glorified support ships with expectations far beyond anything they can honestly deliver. Congratulations Audrey. You'll do a great job. The Christa McAuliffe Space Center Welcomes New Hitchhikers. Volunteer for at least 500 hours at the Christa McAuliffe Space Center and you're welcomed into the Hitchhiker Flight Group. Yes, that's Mason again. This is the catch up on honors long due for him. 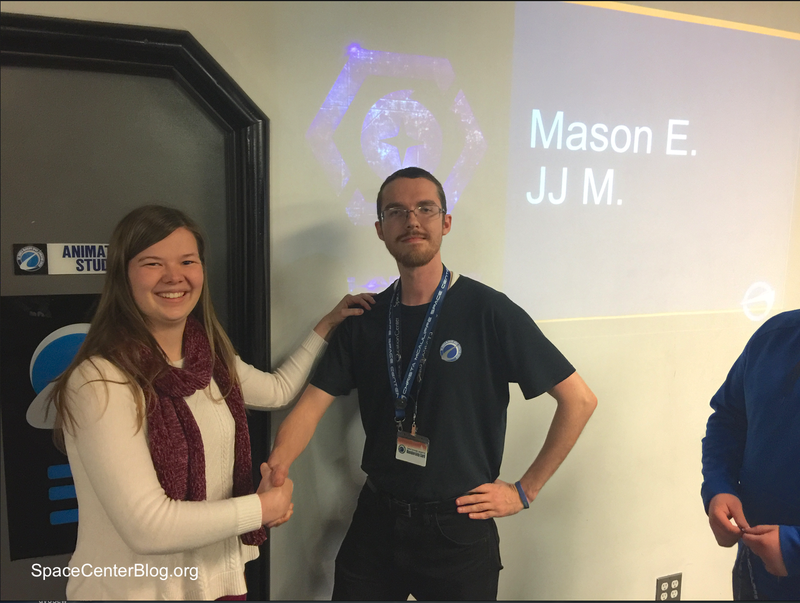 Congratulations Shelby and Mason and thank you for your service to the Space Center. You Don't See Many Journeyman. We All Bow to Your Achievements. Five Years of Service! During my time as Space Center Director I gave Space Center silver pins to those with one year of service; bronze pins to those who hit the five year mark, and gold pins to the few who made it to ten years of Space Center service. Needless to say, I didn't give away many bronze pins and very few gold. 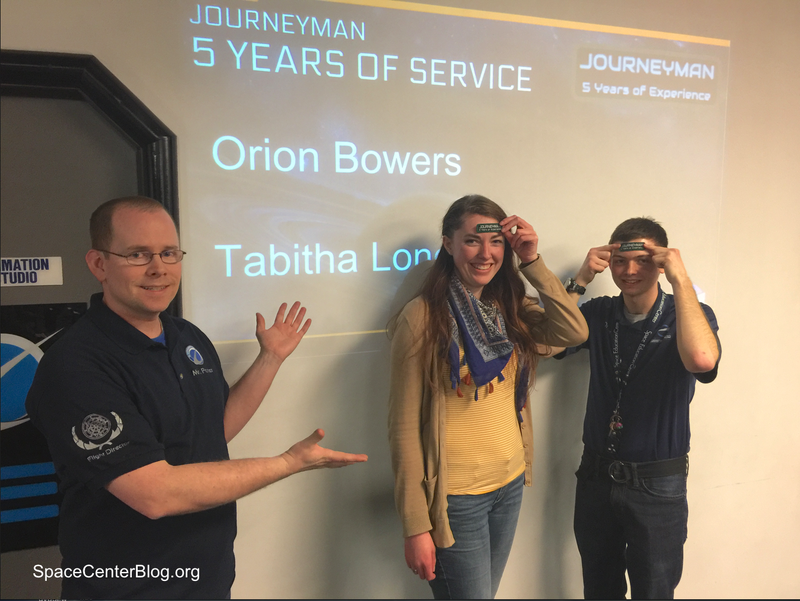 I know what an achievement it is to reach to the five year mark as a Space Center volunteer / staff member. Congratulations to two of the finest people the Space Center has on payroll. Congratulations Tabitha and Orion. There was a large turnout at the January Honor's Night. 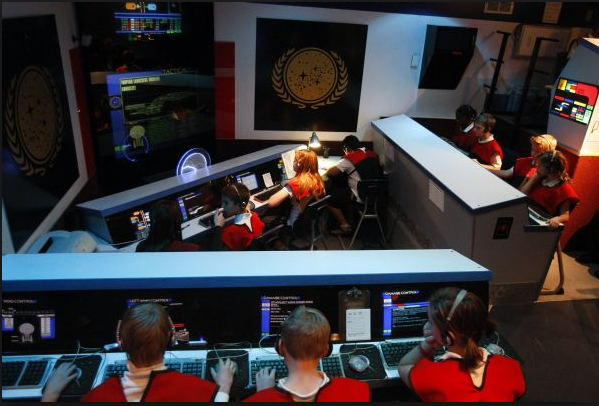 Seeing the Discovery Room full with not a spare chair to be found reminded me of the Space Center's Voyager Era; the time of five simulators and overnight camps. Excitement is building as we get closer to the construction of the new Space Center and Planetarium. 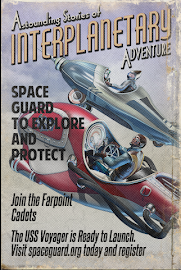 Now is the time to stake a claim if you want to work in the new simulators and planetarium. Volunteers starting now will have two years of service under their belt when the new Center opens over those who jump on board after the fact. I'm imagining a huge rush to volunteer and staff once the new Center opens. Get involved now. The two years it will take to open the new center will put you in a great position for a future job as a supervisor or flight director. 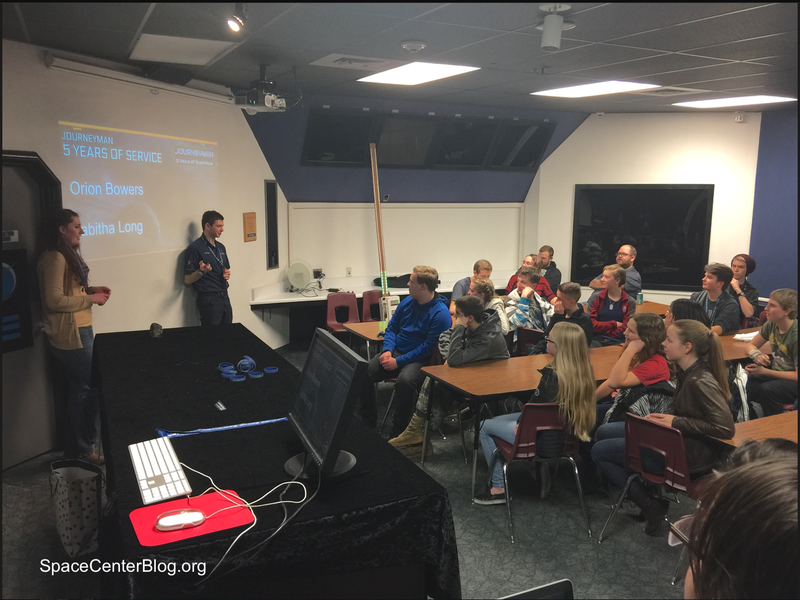 Visit the Space Center's website for more information on volunteering: spacecenter@alpineschools.org.